At this time of year, colour and foliage interest are at a premium in the garden. Many plants are fast asleep and others don't exactly look their best. One of the exceptions are the group of shrubs in the Genus Mahonia. Related to Berberis and in the family Berberidaceae, Mahonia shrubs are native to eastern parts of Asia, the Himalayas and north and central America. Mahonia cultivars are popular amongst gardeners because of their colourful winter flowers, their attractive evergreen foliage and their unfussy requirements when it comes to soil quality and light levels. The shiny evergreen foliage of a Mahonia has spines around the margins and is similar to that of holly (Ilex). The flowers are usually yellow and cup shaped and arranged in bunch like or long wand-like clusters. When the flowering perfomance is over, the spent flowers develop into attactive purple or black berries (in the photo the berries are immature and have not yet ripened to their more distinguished colour). Mahonia shrubs range in size. Some only grow about 30 cm tall, but if this is the case their spread is often much greater, making them very useful as evergreen groundcover. At the other end of the scale, some species and cultivars grow up to 5 metres tall, making them ideal specimen shrubs or the central evergreen focal point in a winter garden. nights than that (and some days) in the last few UK winters. 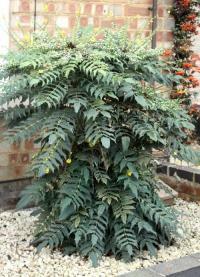 In the wild Mahonias grow in woodland and some on rocky soil. Therefore they are ideal for full or partial shade and a moderately fertile but well drained soil is ideal. 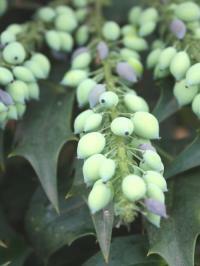 One of the most popular cultivars of Mahonia and also long established is 'Charity'. It is a tall specimen with a very long flowering period from November to March. The flowers are pale yellow and have a fragrance similar to that of lily-of -the valley. Berries deep purple in colour follow the flowers. All in all, with their long flowering winter blooms, ability to thrive in both deep shade and poor soil and their handsome evergreen foliage the Mahonias could almost be described as the perfect shrub. Published on 15 Jan 2012 and Filed under Shrubs.